Product #21254 | SKU 883961 | 0.0 (no ratings yet) Thanks for your rating! If you have a Pentax camera with a smaller-size APS-C sensor and K mount, then the 18-250mm F3.5-6.3 DC Macro HSM from Sigma is an incredibly versatile lens that is a real jack-of-all-trades lens you can carry in any situation. With a focal length spanning from a wide-angle 18mm up to a 250 mm telephoto zoom, with macro capabilities to boot, Sigma's 18-250mm could easily be your camera's first all-in-one lens, or a great replacement for several smaller lenses that you're looking to consolidate. Sigma redesigned the optical and structural design of this lens in order to achieve a relatively compact size, at 10.2 cm long, as well as a close minimum focusing distance of 35 cm for macro photography. Their Thermally Stable Composite (TSC) construction maintains the structure of the lens, with little variation despite changing temperatures. The lens also incorporates a brass-made bayonet mount, to further reinforce the lenses durability and resistance to wear and tear over time. For high image quality, you know you'Voe got to have high-quality glass, and Sigma has incorporated their Special Low Dispersion (SLD) glass element into the 18-250mm. In addition to the SLD element, three aspherical lenses, including a double-sided aspherical lens, have been used in the lens' construction--offering excellent correction of colour aberration, for better clarity and quality of images throughout the zoom range. For a lens that offers a wide-angle to telephoto focal length, and the ability to zoom-in with macro photography, Sigma's 18-250mm F3.5-6.3 DC Macro HSM made for Pentax cameras is more than a match. Whether you're on a macro product shoot, a walk in the park, or have a wedding to go to, this lens will help you shoot high quality images in any situation. 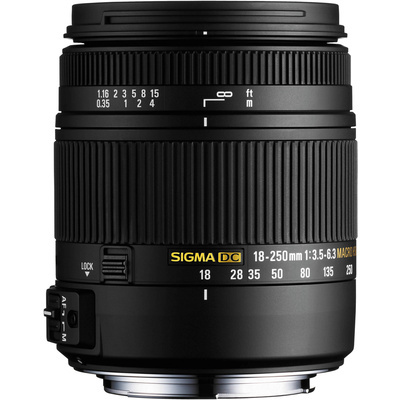 Everybody says you should invest in your glass, and Sigma's 18-250mm provides just the way for you to do that. Three aspherical glass elements offer correction for distortion, four Special Low Dispersion (SLD) glass elements provide optimum colour correction and sharpness, and a Super Multi-Layer lens coating reduces flare and ghosting. This array of optical features assure high image quality throughout the entire zoom range, and widely varying lighting situations.